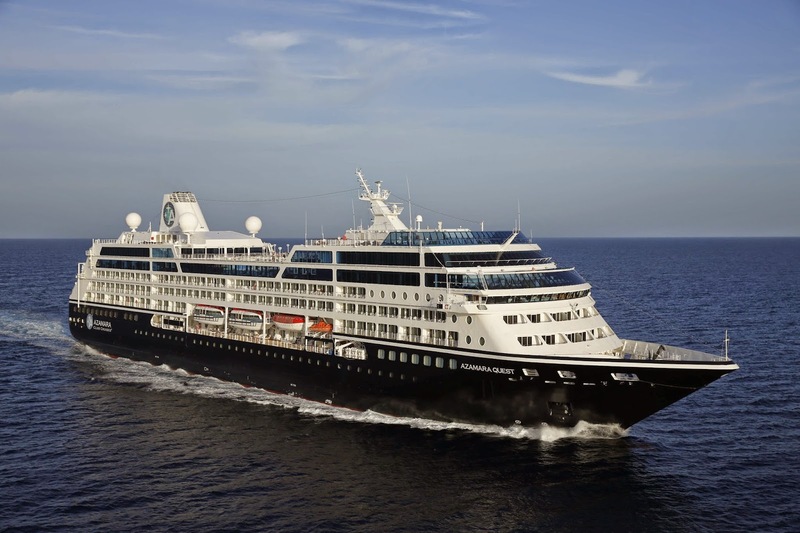 What is Azamara Club Cruises all about? 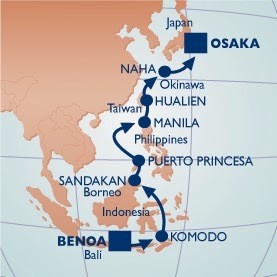 I will be cruising on the Azamara Quest on February 17, 2015 on a 14 night cruise from Bali, Indonesia to Kyoto, Japan in a Club Continent Suite at the invitation of Azamara Club Cruises. Azamara Club Cruises is the upper premium product of Royal Caribbean (with Celebrity Cruises being its premium product) created out of two of the former Renaissance Cruise Line ships (with Oceania Cruises having four of others...expanding from its original three by just purchasing one from Princess): The Azamara Quest and the Azamara Journey. These ships have country club/library decor while accommodating 686 guests (with 407 crew) in staterooms that from small interior ones to some of the nicest, and best located, suites at sea. Note: For those of you wondering about the NCL-Regent-Oceania merger and if NCL will bring down the quality of Oceania (you know how I feel about Regent), there is a similar relationship here and there is not a hint of Azamara Club Cruises doing anything but constantly seeking to elevate its product and distinguish it from Royal Caribbean and Celebrity...while leveraging the guests' loyalty to the brands. In fact, later this year Azamara Club Cruises is pouring millions into these ships with new suite furnishings (hard and soft) as well as updates and changes to many of the public spaces. Azamara Cruises was rather awkwardly introduced a few years ago and it has worked hard since then to gain traction in the upper premium and near-luxury markets. By the way, "Club" was added to the name to clarify the country club-like ambiance Azamara seeks to create. While its prior marketing efforts I felt more confused than enlightened, Larry Pimental - who years ago worked for Seabourn Cruise Line - has brought some Seabourn-eque ideas to Azamara Club Cruises including what it calls "AzAmazing Evenings, which are a once-a-cruise complimentary unique shore excursion, and a semi-open bar policy (more on that later). Also offered on some cruises are Nights & Cool Places evening shore excursion (a bonus with Azamara Club Cruises focusing on overnight stays) and Insider Access excursions that are more local and intimate. As I travel I will talk more about these. · Kyoto (Osaka), Japan (two overnights) - Food, saki, architecture and history! Interspersed are five sea days. I will be sailing in a Club Continent Suite a 266 square foot accommodation which shares it space with everything from a 158 square foot inside staterooms, to 170-175 square foot oceanview and veranda staterooms up to the few 440-560 square foot Owner’s Suites. 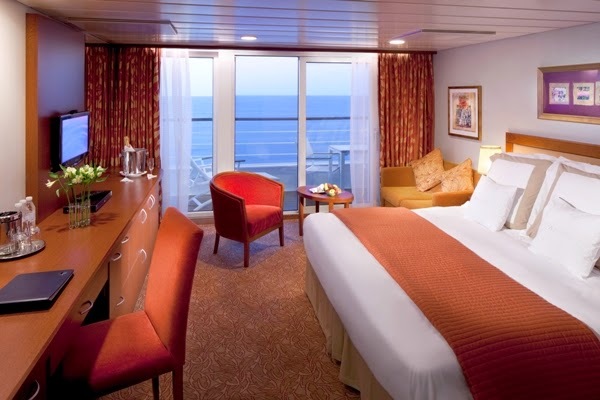 While the standard stateroom showers, built in the late 1980's are quite small and the bathrooms are plain, the suites provide a totally different experience with comfortable spaces, bathtubs and more upscale bathrooms. I will give you more information on my suite once I am aboard. Note: For past guests, Azamara Club Cruises has a $398 per stateroom upgrade offer. You submit a request for an upgrade to the next category (oceanview to veranda, for example) and if available and you are chosen you get an upgrade. Probably the best value (but with the least chance of getting it) is the upgrade from a Club Veranda to a Club Continent Suite, as I will explain. The suites come with a variety of amenities not available in the standard staterooms which, in many ways, mirror Celebrity (though how things are executed we shall see) including a butler, high tea every afternoon and canapes in the evening, as well as room service that includes the restaurant menus for breakfast, lunch and dinner. Azamara also differentiates its dining experience based upon suite vs. non-suite. Along with the other open-seating venues, there are three specialty restaurants: Prime C (steakhouse) and Aqualina (Italian) and the Chef's Table (three different menus per cruise). If you are in a suite Prime C and Aqualina are included in your fare, but if you are in a standard stateroom you are going to pay $25 per person per evening. The Chef's Table is $95 per person. Packages are available to reduce the per experience cost. There is a semi-inclusive beverage experience for all guests, with an array of standard wines and spirits and a few beers included in your cruise fare. If you are in a suite you also receive a variety of 375 ml bottles (Stolichnaya Vodka, Bacardi Gold Rum, Bombay Sapphire Gin, and Johnnie Walker Red Label Scotch) in your suite along with various mixers. There are various upgrade packages which afford you, at a cost to upgrade your water, wines, beers or spirits. The liquor packages are Premium, Top Shelf and Ultimate at escalating per day prices. Another "must have" is internet. Suite guests receive 235 complimentary minutes. There are packages, which seem a bit pricey and, surprisingly, there is no "unlimited" package. So why did I decide to take this, rather unique, cruise? Was it the itinerary - which I really like? Not really. The first motivator is the five days at sea and the three overnight stays all within two weeks. This cruise will truly let me see how Azamara Club Cruises performs and how the Azamara Quest functions with, obviously, an eye on the upper-premium luxury side of things. One other thing I am interested in, which I cannot know until I speak to fellow passengers on board, is how and why they decided to overcome the extremely long (getting to Bali without overnighting and/or multiple plane changes is not so easy) and fairly expensive flights. Clearly there are motivations here that I want to better understand as cruise lines from Seabourn to Windstar have attempted to keep a presence in Southeast Asia without overall success. Stay tuned as I am sure with this itinerary and so much time on the ship to really get into things, there will be a whole lot to write about. I am very enthusiastic. Interested in an Azamara Club Cruise or want more information? Please give me a call at (877) 2GO-LUXURY or email me at eric@goldringtravel.com.